As a business owner, you already understand the importance of curb appeal. You want your storefront to draw in customers, not turn them away. You worry about trash collection, graffiti, snow removal, and general landscape. But when is the last time you checked your concrete? Damaged, unleveled concrete can be a major deterrence to foot traffic. Not only that it can become a major safety hazard. Buffalo winters are notoriously cold and snowy, and as a result, the freeze-thaw cycle wreaks havoc on our roadways. Concrete is no different. How does concrete become uneven? The soil beneath your concrete is poorly compacted. It compresses or shrinks the dirt, creating a void between the soil and the slab of concrete. The soil beneath your concrete dries out and sinks, leaving a void between the soil and the slab of concrete. The soil beneath your concrete gets washed away by flood waters, usually as a result of a burst or broken pipe underground. Tree roots grow beneath the concrete and gradually force the slab to rise. Moisture beneath the concrete expands and gradually leaves the slab, allowing for additional moisture and debris to fill the newly created void. Why should I fix my uneven concrete? If you read October’s article “Why Should You Fix Uneven Concrete?” then you already know the three major risks to your home. These same risks apply to your business. Concrete sidewalks, entryways, driveways, and patios are the property owner’s responsibility. The same way you are required to clear sidewalks of snow in the winter, you should repair damaged, unlevel concrete before there is an accident. It may not be a threat to the structure of your business, but it is a threat to customers who can potentially slip, trip, or fall. How can Bravo Concrete Maintenance help me? Bravo Concrete Maintenance is your primary source for professional service, quality work, and a fair price. 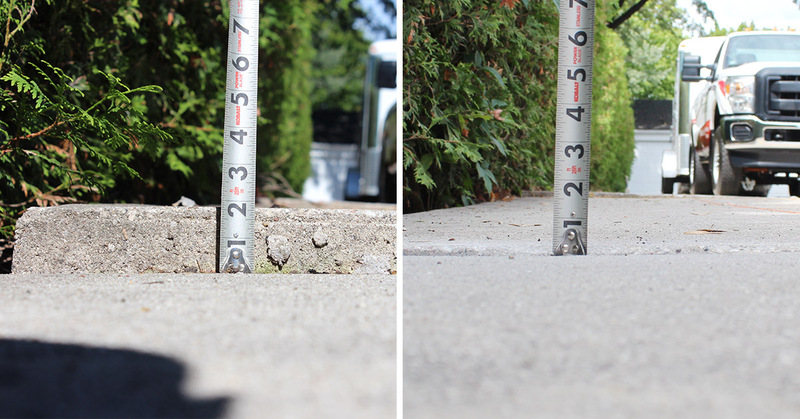 Rather than replace your uneven concrete, let Bravo level your concrete using polyurethane concrete raising: The latest and great concrete repair method available. Most jobs can be done in a day so take advantage of this beautiful Buffalo summer to improve your business. Contact Bravo Concrete Maintenance today or visit our Before and After page to see how we’ve helped other business and homeowners correct their uneven concrete. Powered by New York Marketing.